Why do people film their wedding? I mean, it's not like you'll sit there and watch it over and over again is it? Chocolate Lover and I aren't too big on filming stuff to begin with, hence my questioning of the practice. We don't even buy DVD's or hold on to DVR recordings. I think that once you watch a movie that's it! If you are desperate to watch it again I'm sure it can be found somewhere so what's the point of spending money on collectibles? Then again, I wouldn't mind having a copy of the Shawshank Redemption, so from that point of view if something is important enough or you like it that much, then it's worth having. At the end of the day, your wedding day is important enough that you don't want to regret not having done something after the fact. And with that premise in mind, we will be recording it live from Aphrodite Hills on September 25, 2010. I have lived on 3 continents and each place feels like home. Mr. Milk proposed Christmas morning and I was totally clueless about what was about to happen (some of you may know that already). I have something chocolatey every day (surprise surprise)! We recently started ballroom dance classes at our community center and I have trouble being led! I love pasta and could never do the no carb thing (What are these people thinking! No offence). I love receiving things in the mail (non-bill related obviously). Thanks to online shopping I can still experience that! Almost there... I am addicted to TV (yes I make a great couch potato!). Grey's Anatomy, Oprah, DWTS, you name it, I watch it. Clearly I would go nuts without the DVR! 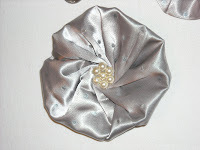 I must admit that before all the wedding planning and blogging I had no idea what Etsy was. After seeing it on blog after blog, I thought it was about time I found out. What a great site! There are so many things that I like and have added to my favorites. And just by browsing I've gotten several ideas for gifts. 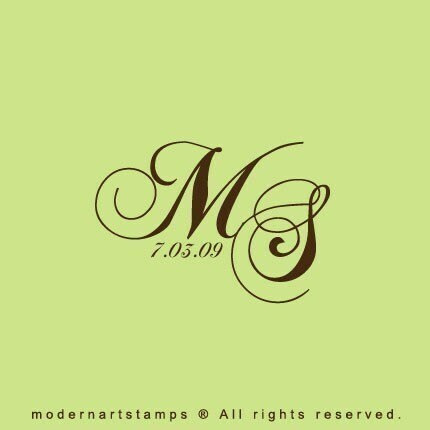 A monogram stamp from Modern Art Stamps. Obviously we are getting it with our initials and wedding date, but what's got us excited about this simple stamp is that its in the font we are using to design our invitations and monogram. Coincidentally! The stamp was cheap, mainly because it wasn't mounted. We figured we could do that. It will take 2-4 weeks for us to get it but I couldn't wait that long to post about it. More to come when its here. Next stop...inks! We've finally managed to get a working copy of Adobe Creative Suite 4 on my Mac. It took a while due to some ridiculous error claiming that the software could not be licensed on my computer. Anyways, that's a different story. Chocolate Lover and I felt that the most efficient way of printing our invites would be by designing them ourselves (since I know how to use desktop publishing software) and by using a printing company that I hire quite frequently at work. Now we are in colour heaven, or hell, depending on how you look at things. For those who don't know much about colours, what you see is NOT what you get, as CL quickly realized. just because you think you found the perfect teal on the screen it doesn't mean that when it's printed it'll look exactly like that. After a quick colour 101 with CL, we are now looking at the proper Pantone colours, coated or uncoated depending on the printing surface, and the right CMYK readings so that our invites look as good on paper as they do on screen. The only thing we are left battling now is the Greek letter for 'P', otherwise known as the numeric 3.14 or 'pi', which is my initial. We want to use that for the Greek invites but unfortunately the script we have for our monogram does not come in Greek. So it occurred to me the other day that I haven't really talked about our reception. While the ceremony and dinner here discussed in a previous post I failed to mention that our reception will be on a totally different day! This is for several reasons. 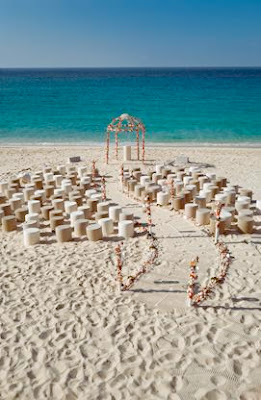 To begin with we want to be able to enjoy our ceremony and dinner with our close friends and family. This will hopefully allow us to spend enough time with the people that are special to us and who potentially travelled hundreds of mile to be with us on our day. Another reason involves the culture and size of Cyprus. We are basically a dot on the map. Unless you know what you are looking for, you will most likely miss this lil' island. Due to its size, it's easy to imagine that between our two families, we know a lot of people. The only thing I guess I can equate it to in terms of North America is living in a small town and knowing more or less everyone. But on a bigger scale. Our parents have people they want to invite but not necessarily people Mr. Milk and I know or are close to. Having the reception on a different day will allow our parents to invite the people who are closer to them. While Mr. Milk and I were ok with missing this step completely, we realized that it is important to both our parents to share their kids joy with their friends and colleagues. My dad and his mom initially did not like the idea of having the reception on a different day. My mom and his dad thought it was a great idea. Go figure. Anyway, the reception will be at a different venue altogether, somewhere cheaper, and will be on a weekday, I think it's a Wednesday. We came to realize that one of the issues people complain about face in Cyprus, is the huge number of weddings they have to go to, starting from May and probably going through all the way to November. Sometimes several Saturdays are taken up by weddings. In a row! And these can be weddings that include THOUSANDS of people. No joke! It's no coincidence the movie was called My Big Fat Greek Wedding! So we thought having a cocktail reception during the week would be appreciated by most of these guest who are coming to support our marriage, but mostly our parents. We will be leaving their weekend untouched. Since our wedding venue is a little out of the way by Cyprus standards (if someone here heard Cypriots complaining about distance they would just laugh at them! ), the second venue is in a more convenient location in the center of the capital city, Nicosia. We came to realize that a large majority of our guests, for both the dinner and the reception, reside in Nicosia. Around 80 to 90% if I had to guesstimate. So we also wanted to make it a little easier for these guests to get to our reception, which will only last a few hours. As you may have figured out, culturally, family is very important to us. Not that it isn't to people anywhere else in the world, but I think we are more inclined to take our parents desires and wishes into account. Initially it was difficult for both Mr. Milk and I. We are not what we would refer to as traditional Cypriots by any means. He has lived in Canada for the last 10 years and I was in San Francisco for the last 5. Not to mention that I grew up in Saudi Arabia and only moved to Cyprus when I was 14. So no, not traditional. We were gung ho on having our wedding the way WE wanted it. But we realized that this went beyond our little worlds and that there were elements of us getting married that were important to our parents, that they took pride in, and I think, to some degree, they would have been hurt if we just went about our business and didn't take into account the things that were important to them. Have others faced cultural/familial dilemmas, issues, concerns? Would love to hear your views! When we were first engaged I scoured magazines and books to get ideas for wedding decor, planning, flowers and what not, being that this was new and all. While in a bookstore, I came across Colin Cowie's book Wedding Chic. I remember seeing him for the first time on Oprah and was stunned, jaw-on-the-floor impressed by the beautifully gorgeous weddings he created. Well then reality set in, and I realized there was no way (not only on earth but the universe), that we were ever ever ever going to afford one of his creations. And these are just the ones I could find on his website! The book is full of beautiful photographs of decor, cakes, centerpieces, paper goods, food and much more. I haven't bought another book since purchasing this one, and I feel like between it and the internet, I have enough to get me going. What kind of resources have you been using for inspiration/ideas? This came to me in an email from my Chocoholic Friend. Apparently this is an actual letter from an Austin woman sent to Proctor and Gamble regarding their feminine products. It was also supposed to be in PC magazine's 2007 editors' choice for best webmail-award-winning letter. Don't know if this is all true but the letter is hilarious nonetheless, and I thought it would be an entertaining midweek post (particularly since I am "stuck" at home studying!). Have you ever had a menstrual period, Mr. Thatcher? I'm guessing you haven't. Well, my time of the month is starting right now. As I type, I can already feel hormonal forces violently surging through my body. Just a few minutes from now, my body will adjust and I'll be transformed into what my husband likes to call 'an inbred hillbilly with knife skills.' Isn't the human body amazing? So needless to say my week started off with a bang! 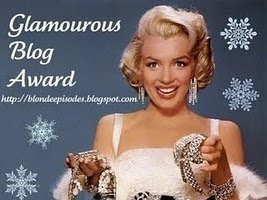 I was the lucky and very honored recipient of not one, not two, not three, but FOUR blog awards! Thanks need to go out to my friends Stacey at You Can't Take it With You and Maria at The Carosello Wedding, as well as to a new blogger friend Lindsay at Lindsay Maddox. 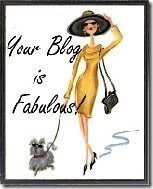 I encourage you to check out these ladies blogs! I do on a regular basis! 5. your favorite food? Italian? 35. favorite place to eat? Anywhere! 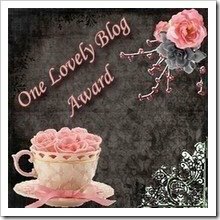 So I would like to pass this the One Lovely Blog award to Sarah at That's What She Said! 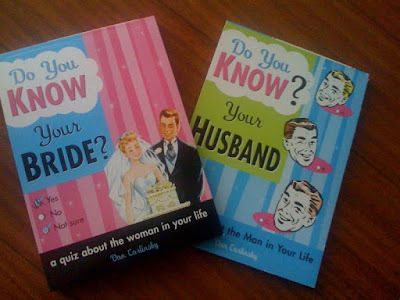 whose blog I recently started following and is also embarking on the wedding planning bandwagon. And the Over the Top Award to Cocktails and Cashmere. Make sure you answer with only one word! 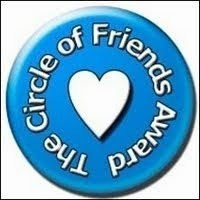 Post the awards on your blog and be sure to let the person you pass the award onto know that you are doing so. Listen up ladies! This is truly important. I just discovered this amazing giveaway and needed to share ASAP! Do you see this picture? Yes you see right. 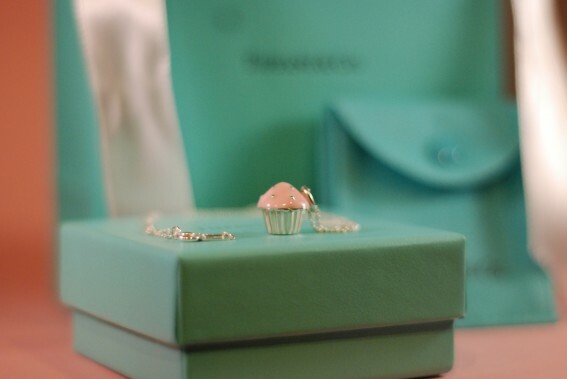 It is a Tiffany pendant in a Little Blue Box and white ribbon and Tiffany bag! 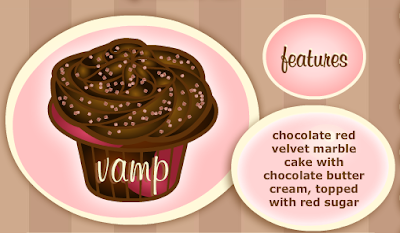 Best of all, its in the shape of a cupcake! And IT CAN BE YOURS! 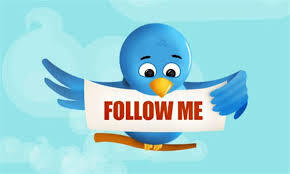 By going right here and entering this giveaway. Good Luck all! 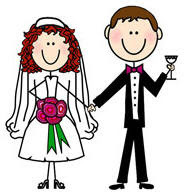 Someone once said that it's easier to find a wife in Cyprus than it is to book a venue. Laugh all you want but our experience this past August confirms that! Chocolate Lover, in an earlier post, discussed our frustration with the fact that EVERYTHING was booked two years in advance! Regardless, we were still able to secure a beautiful venue and we are both super excited about it. I thought I'd provide everyone with more information on the wedding business in Cyprus and some of the traditions that have carried through to today. Back in the day, weddings in Cyprus villages used to go on for three days. One could write a book about the hundreds of traditions and rituals that took place, from the preparation of the bride and groom's bed to the parading around the village. Quite a few of these traditions remain to date, albeit in a more modern form. To give you an example, the mentality behind holding a village wedding stemmed from the belief that the community should pull their resources together and help a young couple to a healthy start of their marriage. Although I've never had the privilege of observing an authentic Cypriot wedding, I am assuming that the general buzz in the village every time someone got married can be described to the 4th of July celebrations in the United States, only extending from the 3rd to the 5th! Pulling their resources together. What does that mean? The barber would give the groom his haircut and the best man would shave him. The village seamstress would help with the sewing of the bedspread and the couple's clothes. Everyone would pitch-in one way or another and the village musicians (a violinist and a "laoutaris" [traditional Cypriot instrument resembling the Greek bouzouki, but not quite]) would play all sorts of songs, each one appropriate to the individual ritual. But the biggest deed of kindness came the night of the wedding when the couple danced for the first time. 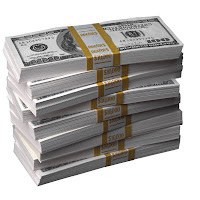 The entire village (and I mean hundreds of people) would pin money (the highest currency bill of the time) on the bride and groom, as a way of generating enough wealth for the newlyweds to invest in their household (the actual house was usually courtesy of the bride's parents) and their soon to be born children. Well, to no one's surprise, if there is one tradition that has been preserved, it's definitely the money dance. These days however instead of dancing around in a sea of Euros, most people bring their "contribution" in a smal 2"x3" evnvelope along with their business card. The exchange happens as the couple greets their guests at a reception style venue, and typically the best man, hiding behing the couple, grabs the little envelopes and throws them in the money bag. If you find this very shocking then brace yourself. I just discovered that a particular bank is now offering an online money transfer specifically tailored to wedding gifts! So to those wondering, no, there is no registry system in Cyprus yet. In typical Chocolate Lover fashion I shall pass the question to you: Do you prefer cash or gifts by registry? Untill next Friday this is Mr. Milk, sigining off. As many of you already know, cutting back on the guest list is probably one of the most challenging tasks when planning a wedding. We have around 350 people on our dinner list! We thought it would be around 300, maybe less, but now that we are over that by far, we need to start cutting people back. Mr. Milk is a laid-back, happy-go-lucky guy. So when he talks about the wedding with people, and they ask questions like "can i bring my brother along?" he is easily and naturally inclined to say "yeah, sure." Although we've discussed this already, I wanted to see where others stand on this topic. We have been thinking to eliminate the "plus one" in our invitations, and restrict it to people who are in long-term/committed relationships. Granted more thought will be put into it at the time the invitations need to be sent out - don't want someone who doesn't know anyone else having to show up completely alone - but we also don't want to have a double standard. Know what I mean? We are concerned about costs and also don't want to have to remove someone from the guest list who is important to us, for someone that we don't even know. I know there is no straightforward answer. Just wanted to see what you gals have thought about/done and any other suggestions. Mr. Milk and I spent a lot of the weekend talking about wedding invitations. We've decided that we want pocket-fold invitations in pearl and aqua metallic paper. We are narrowing down our colors, but are getting stuck on the color of the ink. I initially liked a sand/goldish color but then Mr. Milk suggested silver. Now I'm in a whirlwind of confusion as I can't decide. I like both! So here are a couple of pics of a quick sample I literally threw together just to get an idea/comparison. I was thinking about bridesmaids too (obviously) hense the content! In all honesty I have never been a gold-type-of-person, but for some reason I am attracted to it now! Go figure. I thought I would throw my dilemma out to you gals for some feedback. What do you think? Which do you prefer? Any other suggestions? Help! What a way to start the week! 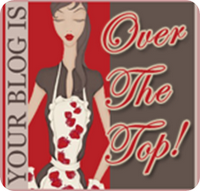 I just received my very first blogger award courtesy of Stacey Marie from You Can't Take It With You (check out her blog)! I love dogs! I could have a farm of them and be completely content! I have 2 back in Cyprus and miss them dearly! I am a food/dessert snob. I eat lunch and am planning what to eat for dinner. But it has to be good food/dessert. No Hershey's Kisses for this one. I could hang out in a supermarket for hours (as Mr. Milk can attest)! I lived in San Francisco for 5 years and never went to Alcatraz. I love shoes! Which girl doesn't! ;-) If heels weren't so bad for you I'd wear them all the time! Cassandra at Sassy Bride on a Mission. 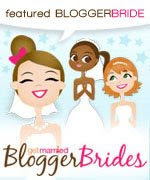 I enjoy reading her blog and she tipped me off to Blogger Brides. Maria at The Carosello Wedding. 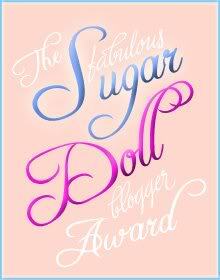 Her blog is super cute and I encourage you to check it out. Katerina at Girl With A Ring. 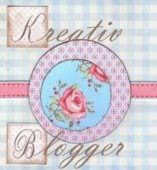 She has great wedding ideas and is another blogger whose blog I follow religiously. Christy at Christy and David. They are having a Disney theme and I LOVE Disney! Sarah at Blue Ridge Baker. Her posts make me drool all over my keyboard (yes thats a good thing). Adventures in Wedding Planning. You need to check out how creative she is! I started my own blog because I was so inspired by reading others blogs. Thanks ladies for making the blog writing experience a great one! 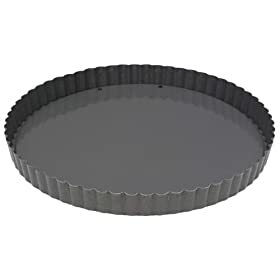 A quick google search revealed that these little gems were reserved for special occasions, such as weddings, because at the time, the ingredients were expensive - butter, sugar, nuts. Also, the nuts were supposed to represent the fertility while the sugar symbolizes the sweet life journey the couple are embarking on. While these are the most commonly given favor in Cyprus, and to some extent, the expected favor, most people don't eat them. There have been many a time that both our parents fridges have had 5-6 on these babies just sitting there. No one wants to eat them. Especially if it's into wedding season and they've had a few already. My mom places them between jars on the fridge door so that the jars don't move and fall out! Ironically, when discussing this with our parents, both were in favor of having these favors (!) while admitting that they don't eat them either! This was very amusing for Mr. Milk and I. What are you thinking about for wedding favors, if anything at all?